On a recent trip to the supermarket, I found these crazy cool dolphin and whale shaped chicken nuggets! 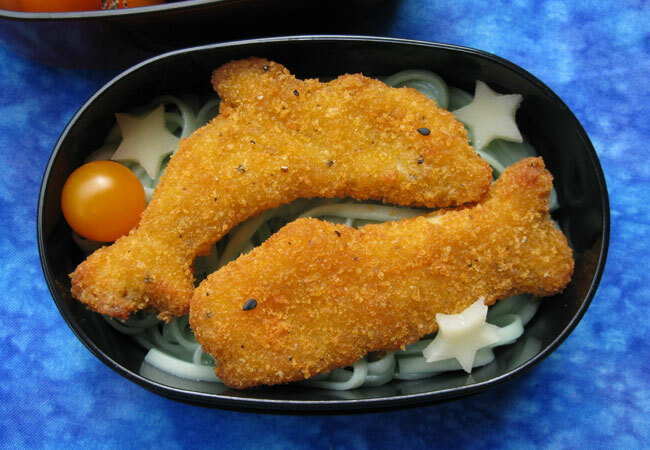 They are called Banquet Ocean Adventures and each is 50 calories, so they are a tasty and not too high-calorie addition to a healthy bento lunch, although not low fat. There were also dinosaur shaped nuggets made by Tyson, too cute! I packed them into my favorite Hello Kitty lacquered bento box. 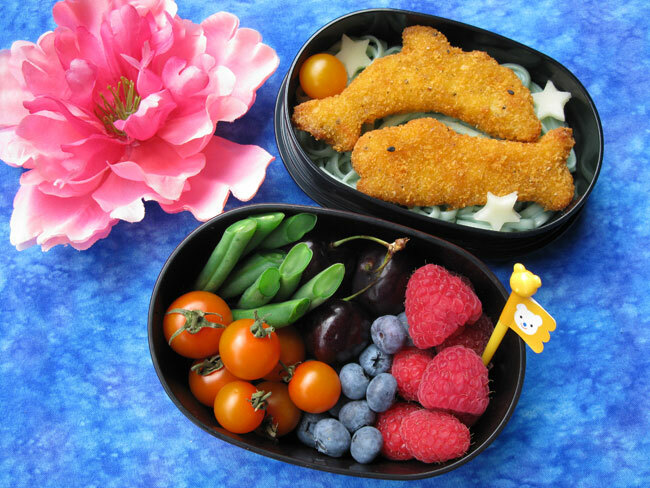 In this bento: Banquet Ocean Adventures Dolphin and Whale shaped chicken nuggets, provolone cheese stars, a cherry tomato, and blue tinted udon noodles (I got the idea for tinting the noodles from Shannon at What's For Lunch At Our House!) tossed with Stonehouse Lime Infused Olive Oil. 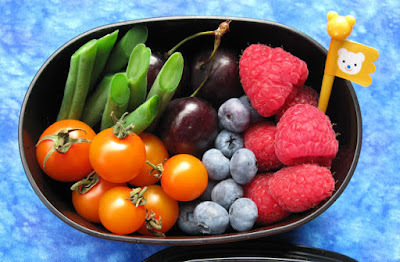 In the lower compartment: blanched green beans from Crescent Moon Farms, cherry tomatoes and blueberries from the Sebastopol Farmers Market, cherries from Hamlow Ranch, a few raspberries and a cute little flag pick I got in Seattle. I saw today on Just Bento that blog author Maki had emergency surgery yesterday. I know that all of us in the bento community are wishing her a quick recovery, and are sending supportive thoughts to her family. I love those nuggets! The whole box is just beautiful, my kids love the tinted noodles too. Shannon, my noodles didn't pick up the color the way yours did, but I still like the shade. It was a fun background for the nuggets. Danke sehr Token! Die Kleinigkeiten (zB Sesame Augen) macht alles soviel besser. Thanks so much bentobird! I really think the colors worked so well in this bento. With such great ingredients to work with, you don't have to do much!